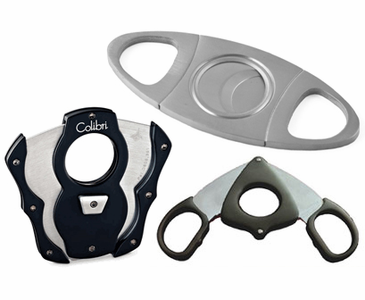 If you think that your cigar cutter is no longer cutting as well as it used to, read the following before you throw it away and spend more money on a new one. Solution: A good cleaning will help improve its performance and is easy to do. You will need cotton swabs, rubbing alcohol and graphite lubricant. Dab the cotton swab with rubbing alcohol and carefully rub all of the metal surfaces on the cutter. Any tars on the blades will come right up. When the cotton swab gets dirty, just replace the cotton swab. Make sure to get all the gunk off the blades. Then repeat the last step with a dry cotton swab to absorb any leftover alcohol. Finally, place a very small amount of graphite lubricant on both sides of the blade and open and close the cutter a number of times. You should notice an improvement of smoother movement. Then wipe off any excess lube with a clean cotton swab. For "X-type" cutters, hold the bottom of the cutter (the narrow end) facing up and apply a very small amount of graphite oil where the blades are held together by the hex screw. You can also apply a little bit of lube under the open/close button. The cutter should then open much more quickly. Make sure you have completely removed all traces of lubricant on any of the exposed areas of the cutter. That's it. A good cleaning in under 5 minutes. Now you have saved yourself from having to purchase a brand new cutter.